Syma H5HW Drone Review 2019 – is the Syma H5HW quadcopter worth the money? Review of features, pricing, flight duration, battery, camera and more. Syma H5HW drone is an upgrade of Syma X5SW quadcopter. This new model is an incremental update with the addition of an altitude hold feature. Syma H5HW also comes with two different color schemes; white and lime green accents, and pastel blue with black accents. This X-shaped quadcopter comes with landing legs that enable it to land on rough surfaces. Syma H5HW is an entry-level drone that packs all you need in a drone. It is beginner-friendly due to its predictability and ease of flying. The 8mm motor size resets the barometer every time it is armed. Syma H5HW has a 0.3 MP camera resolution that allows you to capture pictures and 640×480 videos in JPEG or 3GP file format. With the 8 minute flight time, you can get aerial views as you fly this drone. Syma H5HW comes with a 3.7v 500mAh LiPo battery that has 120 minutes charging time. The control distance is 50-100m, and four 1.5V AA batteries power the transmitter power. Syma H5HW drone can fly in windy conditions as opposed to its predecessors. The flight stability, as well as the subdued nature of this drone, make it beginner friendly. You can use this entry-level drone to learn how to fly without feeling pressured and clueless. It has a predictable flight operation and labeled buttons that make navigation simple and easy. Achieving both fast and slow speed with the quadcopter is possible. 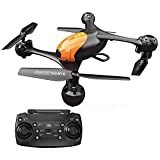 The slow and less aggressive nature of this drone is desirable because it makes learning easy and fast. You can take aerial videos and photos both indoors and outdoors without any problem. To make Syma H5HW a lively sports flier, remove the prop guards, the camera as well as the landing legs to make it lighter. This drone can perform automated flips with the push of a button. The altitude hold feature lets the quadcopter to hold itself in a tight altitude envelope. The altitude hold feature works best in clam flying conditions. This decent toy quadcopter showcases excellent flying performance due to its stability, precision, and smoothness in the air. Syma H5HW is a well-built drone that comes at an affordable price. The durable body can take a beating without breaking. It is beginner friendly in the sense that you can smash it into walls as you learn how to fly without it getting damaged. With the cheap replacement parts, you get to continue using this toy quadcopter even after it gets damaged. The drone comes with an elaborate instruction booklet that outlines everything you need to know about flying it. The labeled buttons tell you what each button does; making the operation of thus toy quadcopter easy. Syma H5HW has a camera with 0.3 MP WiFi FPV resolution. You can capture clear videos and photos as you fly this drone indoors or outdoors. You will need to download and install Syma FPV app to view the FPV video downlink. You can use smartphone WIFI to connect to the drone so that you view videos you’ve captured. It is possible to use your smartphone to record videos taken by the quadcopter. The transmitter with a built-in WiFi FPV has a range is 50-100m, and with a clear line of sight, you get excellent performance from the camera. Even though the camera comes with toy grade optics, it captures clear images and photos. You can use the camera for the roof as well as high-rise building inspections. Looking at Syma H5HW and Syma X5SW side by side reveals several similarities in design and functionality. Syma H5HW being an upgrade of Syma X5SW has superior features and better flight performance. As opposed to Syma X5SW, Syma H5HW can be flown in windy environments. Syma H5HW also comes in more attractive color schemes, and it has a built-in barometer for hovering. Flying Syma H5HW is easier due to its predictability and flight stability. One would easily choose Syma H5HW over Syma X5SW due to the FPV mode incorporation. FPV drone racing fans will appreciate being able to view the real-time feed from the Syma H5HW. The barometer provides consistent air pressure reading that makes flying Syma H5HW smooth and easy. Syma H5HW is an excellent entry-level drone that you can get at an affordable price. The camera effectively records videos and captures photos when you get a clear line of sight. 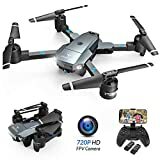 The price and functionality of this drone are suitable for beginner drone fliers. The altitude hold feature is attractive, and it’s also able to do flips. The barometer resets itself when the motor is armed. Syma H5HW is an easy to control drone that allows you to learn how to fly without feeling clueless. 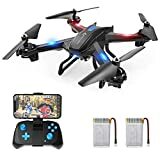 This entry level toy quadcopter is affordable and easy to operate. The inbuilt barometer protects this drone from hitting the ground. The simple design of the drone allows beginners to operate it even with little knowledge of drones.